Many of the plants in gardens today benefit from trellises. Fortunately, trellises come in a range of designs that are attractive and functional. Trellises used in the right way can enhance the appearance of any property or garden. It is important to know how to decorate with aluminum trellises. Start by finding an appropriate space for the trellis. Do not put the trellis by itself in an open area. It will look awkward. The trellis should be part of a large structure of plants, walls or other features. The trellis should be integrated into an environment where the surrounding items or plants have the height as well. Panel trellises can be mounted on a wall or arranged into a long structure that connects to other tall plantings or fences. The next step is to secure the trellis in place. This is important since wind, weather and even the plants themselves will all apply pressure to the trellis. If it is not secure, then it could come crashing to the ground potentially damaging the plants. Stake a freestanding trellis in firm soil. Earth staples can increase the stability of the trellis. Use solid hardware and a drill to attach panel trellises to walls or fences. The main purpose of aluminum trellises is to support plants. This requires training the plant to grow on the trellis. Training is relatively easy. Start by taking plants and gently guiding them towards the metal bars of the trellis. Use plant ties, ribbons of fabric or clothespins to secure the growing plant to the trellis. Twist the plant around the aluminum bars as the plant continues to grow. The plant will eventually start to grow naturally around the trellis. The final thing to remember is to clean around the trellis regularly. This is important because weeds could start to climb up and harm the plants. Additionally, the trellis could come loose or debris could damage the finish. Go out and look at the base or mounts holding the trellis in place and ensure that there are no problems. Yard art comes in many forms from mirror balls to small sculptures. Something more distinctive is wire artwork in the shape of spheres. These are attractive and interesting to look at. They also have several uses. Wire yard art can be used in a few different ways. One way to use wire art in a yard is like a hidden accent in a garden. Although precise arrangements of flowering plants and bushes are attractive, they can be enhanced by adding an unexpected piece of art to the landscape. This is done by finding an area where there are no plants growing or where there are only low growing plants. Place the piece of artwork in a way that makes it less visible from outside the garden. This allows anyone walking through the garden to have a sense of discovery and excitement when running across the artistic piece. A more practical way to use wire art is as a trellis for plants. Some plants and vines need support in order to grow properly. This is true even for very common vegetable plants like tomatoes and beans. Wire artwork is perfect for this because it is stable, durable and contains enough space to keep the plants happy as they grow and flower. The simplest way to do this is to place the artwork in an area surrounded by plants. Attach the artwork to the ground with pins or earth staples. It is then possible to train the plants up the individual wires during the season. The right types of plants could actually encompass the entire piece of art. A final way to use wire yard art is to create a topiary. This is a sculpted shape made from a bush or tree. The wire art provides the structure and an accent for the topiary. Creating a topiary involves placing the art above the ground on a stake. Another option is to attach the wire art to the actual plant if the central trunk is strong enough. The bush or tree is then trimmed as it grows to fill the art and slowly cover the wires. This creates a unique point of interest in a yard. Vintage milk containers have a large group of collectors who value them for their rich history. Home milk deliveries started back in the late 1800s. The milk bottles made before the 1930s were shaped round. The 1940s brought square milk bottles that became even more popular. The 1950s brought the waxed paper cartons for half of the milk delivered to the nation. Home deliveries were stopped during the 1960s since most trucks now carried milk to the local grocery store. Many collectors collect milk bottles because it reminds them of a happy childhood. Collecting is a popular hobby found in America. Almost everyone collects something whether it is stamps, coins, art or milk bottles. Online auctions make items easier to find to collect. However, online auctions makes some items that were previously collectible not as valuable since the market becomes saturated. Milk bottles are harder to find and are still a popular online item. Back in the days of home milk deliveries, families often had only one car. The mother was traditionally the one who stayed home with the kids. This made going to the store for milk a difficult process. Home milk deliveries ensured that kids could get their daily dose of vitamin D and calcium. The milk man would drop the bottles off at the front door for the homeowner to carry inside. A great place to find antique milk bottles are online websites that specialize in these items. The prices are fixed instead of determined at auction. This is where you are likely to find rare and unusual milk bottles. The most popular milk glasses are the ones that have the manufacturer’s name on them. You might be able to find one at a local antique mall, but antique road shows are a more likely place to find the kind of milk bottle you collect. The milk collecting market is likely to grow throughout the next century as these bottles become even more rare. Ladders are invaluable tools that can be used for a variety of tasks around the home and yard. If the ladder is made from wood, then it needs to be cared for to remain safe and attractive. It is important to know how to care for a wooden ladder. 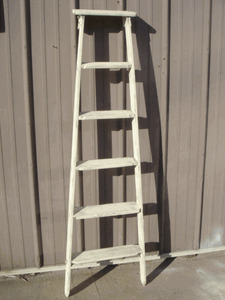 The first step is to replace old or rusted hardware on the ladder when it will be used as more than a decorative piece. Rusted hardware on the ladder can break easily under a small amount of weight. It also tends to accelerate the deterioration of the wood around the metal parts. This can quickly make the ladder unusable after just a few seasons. Replace the hardware with exact matching pieces whenever possible. If the ladder starts to look dry and brittle, then treat the surface with some oil. The best option is linseed oil although other specialty oil products will work too. It is generally not a good idea to attempt to paint or seal the surface with harsher products since they can make the ladder slippery. One treatment with linseed oil every year or two is usually enough. Avoid storing a wooden ladder outdoors where sunlight, pests and weather can cause problems. This will dramatically shorten the life of the ladder. Keep it in a sheltered location with some temperature control like an insulated garage. If it is necessary to store the ladder outside, then keep it somewhere protected like under a porch or awning. This will prevent many problems such as premature rotting. A final step is to use the ladder as intended unless it is going to be a purely decorative piece for the home or garden. Do not place the ladder on the edge and sit on the side railings. Move up the ladder slowly. Avoid bringing too much weight onto the ladder. Ensure the feet of the ladder are firmly planted on level ground before climbing up. This will prevent damage from regular use. Make your property stand out with beautiful and unique metal yard art. Not only will it make the area more interesting for your family, but it will certainly be a conversation piece with your guests. All of this folk art is hand made with their own personalities. Popular animals come in different sizes to fit perfectly into the designated space as well as into your budget. Explore the possibility of adding a butterfly, angel cat, miniature poodle, Scottie dog, owl, rabbit, turtle, frog, bird and others depending on your personal interests. Lawn ornaments, garden furniture, planters, trellises, topiaries in a number of sizes and shapes that accommodate all types of climbing plants and vines, a miniature cast iron birdbath and bird, weather vanes, sundials, an American flag and more create a fascinating miniature setting. Some metal garden art is accented with beautifully blown glass, which adds vivid color to decorations in your landscape. New wrought iron colors include Clear Coated Rust, Moss Green, Antique White, Creamy Yellow, Turquoise, Satin Shell White, Vintage Brown, Antique Turquoise, Flat Black, Vintage Green and Vintage Yellow. This fun wall art in cast iron is the perfect answer for those small spots on your wall that need a decoration. Easy to install connecting Metal Flower Border Edging Fencing is available in a variety of decorative styles and creative designs. Fencing can also be used to go down steps as a railing or can surround your deck. Many screens are modeled from fireplace screens and are hinged to adjust as you desire. Great to separate large spaces to define areas, customers use these in the home, on the patio, or in the garden. Everyone will love visiting such an outstanding display of unusual metal yard art among the flowers, vines and bushes in your garden.